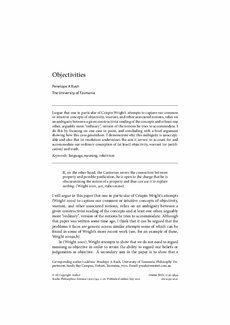 I argue that one in particular of Crispin Wright’s attempts to capture our common or intuitive concepts of objectivity, warrant, and other associated notions, relies on an ambiguity between a given constructivist reading of the concepts and at least one other, arguably more ‘ordinary’, version of the notions he tries to accommodate. I do this by focusing on one case in point, and concluding with a brief argument showing how this case generalises. I demonstrate why this ambiguity is unacceptable and also that its resolution undermines the aim it serves: to account for and accommodate our ordinary conception of (at least) objectivity, warrant (or justification) and truth.